Dr Onu is the present Minister of Science and Technology of the Federal Republic of Nigeria appointed by president Buhari in November 2015. He was the first Executive Governor of Abia State, Nigeria from February 1992 to December 1993. He was the National Chairman of the All Nigeria Peoples Party (ANPP)., until its amalgamation with other Nigerian opposition parties in February 2013 resulted in the creation of the All Progressives Congress. Dr. Ogbonnaya Onu was born on December 1, 1951, to the family of His Royal Highness, Late Eze David Aba Onu, Eze Adu of Uburu in Ohaozara Local Government Area of Ebonyi State in Nigeria. He obtained grade one with distinction in his West African School Certificate examination at Izzi High School, Abakaliki, Ebonyi State. Dr Onu also obtained distinctions in Physics and Chemistry at the Higher School Certificate examination at the College of Immaculate Conception, CIC, Enugu, graduating as the best overall student. By 1976, he graduated with a first class honours degree in Chemical Engineering at the University of Lagos. He later obtained his Doctor of Philosophy degree in Chemical Engineering (without passing through a Masters degree) at the reputable University of California, Berkeley, in 1980, where he did extensive work on coal liquefaction and production of synthetic fuels under mild conditions. He showed that it was possible under relatively mild conditions to produce synthetic fuels comparable with crude oil. While in the University of California, Berkeley, Dr. Onu was the President of the African Students Union; Member, Graduate Assembly of the University of California at Berkeley and also President of the Nigerian Association of Northern California, Inc. Back home, he served as President General of his alma-mater, Izzi High School, Abakaliki, Old Boys Association. Coming out of higher school, Dr. Onu taught at St. Augustine’s Seminary, Ezzamgbo, Ebonyi State. After completing his doctoral studies in the USA, he returned to Nigeria at the time when many others in his situation preferred to stay back. On coming back from overseas, he taught at the University of Port Harcourt as the pioneer Head of the Department of Chemical Engineering. On several occasions, he served as Acting Dean of the University’s Faculty of Engineering and was also elected as a Member of the Governing Council of the university. As a pioneer staff in the Faculty of Engineering and the first Head of the Department of Chemical Engineering, he helped nurture the department from scratch to a position of repute. As a member of the Governing Council of the University, he worked with others to provide leadership in its search for excellence. While in Port Harcourt, he became President of the Rotary Club of Port Harcourt and the Chairman of the Nigerian Society of Chemical Engineers of old Rivers, Cross River and Akwa Ibom States’ Chapter. Dr. Onu was the pioneer National President of the Raw Materials Society of Nigeria. The Raw Materials Society of Nigeria, RMSN, with the sole aim of encouraging Nigerians to look inwards in the sourcing and utilization of raw materials, played a very important role in the establishment of the Raw Materials Research and Development Council, RMRDC, by the Federal Government. He served as a member of the First Board of Governors of the Federal Government Raw Materials Research and Development Council. By the establishment of the RMRDC, there was no longer any need for the RMSN to continue to exist since both of them had the same function. Dr. Onu is a Fellow of the Nigerian Society of Chemical Engineers, Fellow of the Nigerian Society of Engineers and Fellow of the Nigerian Academy of Engineering. He was also one of the longest served Directors of the Nigeria Cement Company, Nigercem, Nkalagu, Ebonyi State. He was the Visitor of Abia State University, Uturu (1992-93), having worked tirelessly to secure the University for the State. In 1991, Dr. Onu was elected the first Governor of old Abia State. He was the first Chairman, Conference of Nigerian elected Governors, the first Nigerian ever to head a forum of all governors. During his eventful tenure as Governor, he emphasized the use of technology as an important instrument for national development by starting work in the establishment of a Technology Village, as well as towards introducing computers into selected public schools. He introduced the Free Maternal Health Care Programme which enabled poor pregnant women to receive free healthcare services as a measure to reduce death during pregnancy and childbirth. Security of lives and property were considerably enhanced such that within a single year, the Abia State Police Command received two letters of commendation from the Inspector General of Police. Also the West African Examination Council (WAEC) commended the State on her stand against all forms of examination malpractice in her schools. Dr. Onu is a resolute believer in Nigeria’s unity as an instrument for national integration and development. As Governor, he abolished the State of Origin Syndrome in Abia State and led the way in appointing non-indigenes of the State into top positions of responsibility in his Administration. Using the Abia Dream as a philosophy to mobilize the people of the State to achieve excellence in all spheres of human endeavour, Dr. Onu founded the Abia State Polytechnic at Aba. He also established the College of Technical Education in Arochukwu and attracted the Michael Okpara Federal University of Agriculture at Umudike, near Umuahia. In addition, Dr. Onu established the Broadcasting Corporation of Abia State as well as the National Ambassador Newspapers, which then won several awards as the best State owned Newspaper in Nigeria. As a God fearing leader, he christened Abia “God’s Own State” and symbolized his noble dream for the State by building the ‘Abia Tower of Peace’. In 1999, he emerged the first Presidential Flagbearer of the then All Peoples Party, APP, which was later known as the All Nigeria Peoples Party, ANPP. 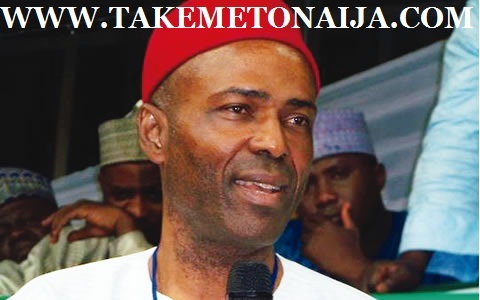 A true democrat and committed party loyalist, Dr. Onu demonstrated rare political discipline and consistency, by remaining one of the very few founding leaders of the opposition ANPP who remained in the party since its inception in 1998 until it merged into a new political party in 2013. Little wonder, his fellow party men and women in September 2010, in recognition of his rare political fidelity, discipline, steadfastness and exemplary commitment to the party’s ideals, elected him their National Chairman. As the Head of the leading opposition political party, he was the Leader of Opposition in the country. Dr. Onu remains a worthy role model for young politicians who are principled and put service and the common good above all other considerations. Just within a period of two years in office, as National Chairman, he united the Party and repositioned it for future electoral victory. Dr. Onu upheld internal democracy, adhered strictly to the Constitution of the Party and also introduced reforms in the ANPP. He initiated both a revised Manifesto and Constitution for the Party. Through thoughtful and fearless comments on issues of national importance, Dr. Onu restored the lost glory of the ANPP to become a credible opposition Party in Nigeria. A man of ideas, he worked on ways of positioning the ANPP to lead Nigeria into issue-based and ideas-driven politics. In 2010, as National Chairman of the defunct ANPP, he initiated discussions with the leadership of the defunct Action Congress of Nigeria (ACN) on how all the major opposition political parties could work together to effect change in the politics of the country. Later he also initiated meetings with the National Chairmen of all major opposition political parties. All these efforts and many others, finally resulted in the merger of the Action Congress of Nigeria (ACN), All Nigeria Peoples Party (ANPP), Congress for Progressive Change, (CPC), and groups from the All Progressive Grand Alliance (APGA), and the Democratic Peoples Party (DPP). Hence on July 31, 2013, the All Progressives Congress (APC) came into existence. Dr. Onu and other party leaders willingly gave up their positions as Independent National Electoral Commission (INEC) withdrew the registration of ACN, ANPP and CPC. On November 26, 2013, the new PDP, broke away from the ruling political party and joined the APC. This helped make the APC, the largest opposition political party in the history of the country. For over two decades, Dr. Onu delivered thought provoking lectures on different contemporary issues of national and global importance both within and outside the country. Some of the lectures include; “Nigerians should not allow one party rule” at the ANPP National Assembly Caucus, National Assembly Complex, Abuja; “Upon this Rock will Nigeria Arise” Special Session of the Kano State House of Assembly; “It is time to stand for Something”, Special Session of the Lagos State House of Assembly and “The fist as symbol of strength”, Special Session of the Benue State House of Assembly. Others are “Taking Nigerians for granted”, Special Session of the Yobe State House of Assembly; “The Eagles Flight in the Global Village”, Special Session of the Kebbi State House of Assembly and “The relevance of Opposition Parties in deepening democracy in Africa” , Maiden Republic Day lecture, Ghana National Union of Polytechnic Students, Accra. Honoured with several awards and recognitions both within and outside Nigeria, Dr. Onu is The 2004 Man of the Year of the reputable American Biographical Institute. He was honoured with the Governor of the Year (1992) Award and also the Star Governor (1993) Award. He is a recipient of the Kwame Nkrumah Leadership Award 2011/2012 by the West African Students Union Parliament and Honoured with “Vanguard of True Democracy” award by the Pan African Students Union Parliament. Conferred with honorary Doctor of Letters (Honoris Causa) by the Abia State University, Uturu, Abia State and also the University of Lagos Golden Jubilee Distinguished Alumni Award. He is an honorary citizen of many cities in the world, in addition to the State of Texas in the United States of America. Dr. Onu also holds many traditional chieftaincy titles, notably: Ikeoha Uburu, Dike-Eji-Eme-Udo of Eastern States, Akajiugo Nnewi, Ogbuagu Abiriba, Ugochinyere Umuahia, Ozurumba Orlu, Odiukonamba Eziudo Mbaise, Dikeora Abagana, Ikemba Afikpo. He is also the Togbe Kwami Vidza of Kpando District, Ghana. Dr. Onu is a member of the ancient and noble order of the Knights of St. John International (KSJ). He is the author of many books, notably: “Technology and National Development”, “Building a Modern Nigeria” and “A Footprint: Memoirs of a Chief Servant”. Dr Ogbonnaya Onu is presently the Minister of Science and Technology of the Federal Republic of Nigeria; inaugurated on November 11, 2015. A fine statesman, brilliant scholar, outstanding intellectual, accomplished administrator, prolific author and poet, a man of great ideas and inventions as well as a distinguished man of exceptional principle and exemplary character. He is married to Dr. (Mrs) Chinyere Onu, with children. Onu does not have much controversies on him.